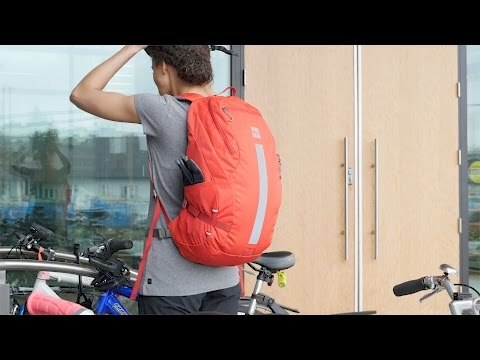 This cyclist-specific pack makes it easy to do chores and run errands on your bike. The main compartment opens wide to hold groceries and a U-lock. Lash points let you add your own cords to secure your helmet, yoga mat or extra layers. Mesh covered back panel with peforated foam keeps you cool when you’re riding hard. Key-clip equipped front pocket holds small essentials accessibly. 2 internal mesh pockets for organization. 2 stretch-woven side pockets hold water bottles, coffee mugs, etc. Compression straps keep your load close and stable. Attachment point holds a rear blinkie light up high, for easy spotting. Grab handle for comfy toting. Built-in rain cover with reflective treatment. Hydration reservoir ready with a hanger system and your choice of left or right tube routing. Glove friendly zipper pulls for colder weather commuting.